DETROIT (Aug. 31, 2010) -- To meet energy initiatives, cut costs, and to help better protect Soldiers, the Army is looking to industry for solutions and partnerships. 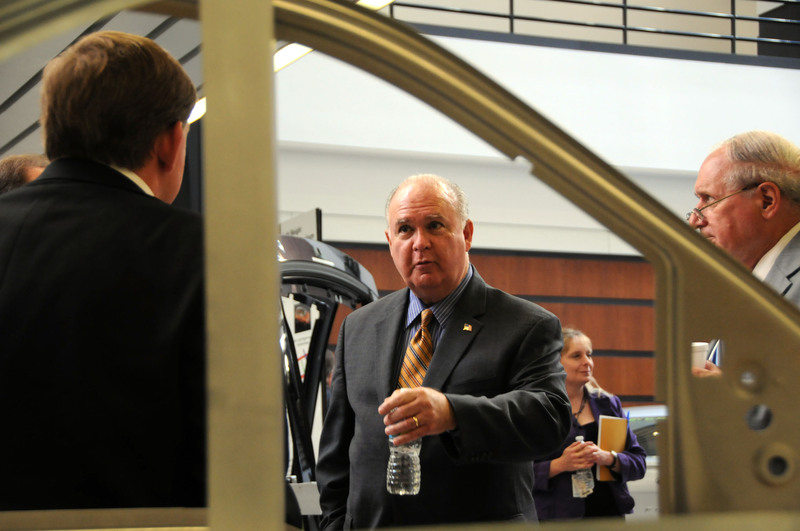 Under Secretary of the Army Joseph W. Westphal traveled to Detroit Aug. 26 to visit the Army's Tank Automotive Research, Development and Engineering Center, along with automakers General Motors and Ford. While visiting Ford Motor Company's research division, Aug. 27, Under Secretary of the Army Joseph W. Westphal and Sen. Carl Levin of Michigan met with Ford executives to discuss the Army's drive towards energy efficiency. During the Aug. 26-27 visit to Detroit, Westphal and Levin visited General Motors, the Army's Tank Automotive Research, Development and Engineering Center and Ford Motor Company. In the foreground, a Ford-manufactured aluminum door frame that weighs substantially less than its steel cousin. The weight savings translates into fuel savings. The secretary's visit to the Michigan sites came at the request of U.S. Sen. Carl Levin, the state's senior senator and chairman of the Senate Armed Services Committee. "He had a great interest in me learning more about what TARDEC does and its connection to the auto industry and its connection to the Department of Energy," said Westphal, of Levin. "My goal was to come here and see it with him and get a broader perspective of their work, their mission and those relationships." Outside the General Motors Technical Center in Warren Michigan, Westphal and Levin test-drove a Chevrolet Volt -- a plug-in hybrid electric vehicle. Following the drive, the two visited with GM executives at the center to discuss the Army's efforts toward energy efficiency, and what General Motors is doing in that area that could be done in partnership with the military. Westphal and Levin then traveled to the nearby TARDEC facility to see how Army researchers are developing technologies related to both Soldier safety and fuel economy -- two things Westphal said are important to the Army. "What I'd like to see us make the most progress in would be to first of all do whatever we need to do to continue to maximize protection for Soldiers in the battlefield," he said. "We are doing everything we can in that respect with all of our vehicles that we are using in the fight. And secondly -- to the extent that we can maximize energy savings -- have less dependency on petroleum products and fossil fuels, both in combat and at home." During his visits to GM, TARDEC and Ford, the secretary said he saw evidence of that. "I think we saw evidence that there are a lot of potential technologies and infrastructure we can use," he said. "Some will require upfront investment -- that's more costly -- we have to make those decisions to do that." While at TARDEC, the secretary saw technology related to fuel efficiency, Soldier safety, and development of battery technology that would allow Soldiers and equipment to yield more power at less weight. Sonya Zanardelli, an electrical engineer and the energy storage team leader at TARDEC, was one of those Westphal and Levin met at TARDEC. She is part of a team now looking at better alternatives to the lead-acid batteries now in 95 percent of Army vehicles. One goal, she said, is to increase the "silent watch" time possible for Army combat vehicles. "What that means is on the vehicles you can power all of your electronics with your main engine off and have something called 'true silent watch' -- engine off and power everything with a battery," she said. For Soldiers, that means the ability to conduct operations in silence, in the dark, virtually undetected, for as long as possible. That length of time is limited now by the duration of lead-acid batteries. Zanardelli said battery chemistry can determine the length of time equipment can operate. A lithium-ion battery, for instance, has an energy density three times that of a lead-acid battery. "You can power your mission equipment much longer," with a lithium-ion battery, she said. Important also is "energy density" -- that's the amount of energy a battery can provide compared to the weight of the battery. "We're looking for high-energy density batteries, high-power batteries, so the Soldier can carry his load and not have to change batteries as often," she said. That also means that Soldiers would have less weight to carry. 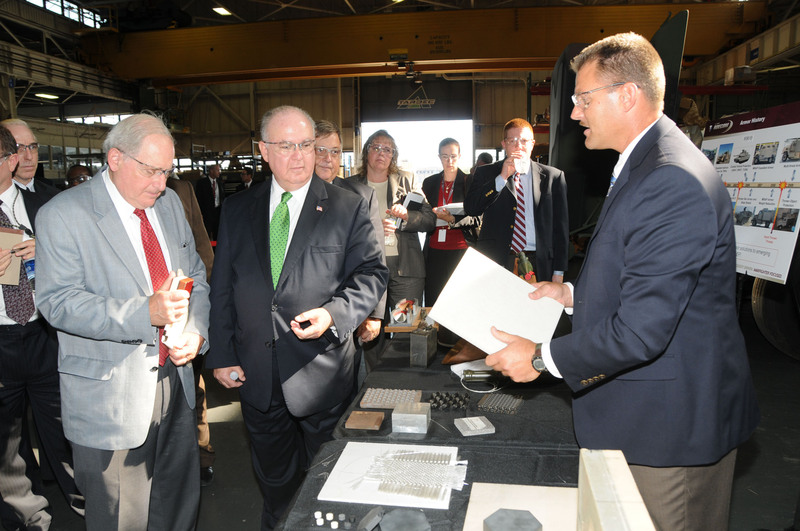 While visiting the Army's Tank Automotive Research, Development and Engineering Center, Aug. 26, Sen. Carl Levin of Michigan, left, and Under Secretary of the Army Joseph W. Westphal, center, met with Steve Knott, of TARDEC's ground systems survivability division. Knott explained to the senator and the secretary new advances in lighter armor for Army combat vehicles. During the Aug. 26-27 visit to Detroit, Westphal and Levin visited General Motors, the TARDEC and Ford Motor Company. Zanardelli said one challenge with lithium-ion batteries, however, is that they are subject to "thermal runaway." That's a condition where the batteries overheat due to the chemical reactions inside them. That condition can be managed by battery management systems that control energy use and monitor temperature. "One of the challenges is how to mitigate thermal runaway and how to develop a smarter more intelligent battery management system," she said. "If the battery management system fails, the battery shuts down." Steve Knott, with TARDEC's ground systems survivability division, also met with the secretary and senator. He discussed technologies being developed now that provide lighter protection for combat vehicles, yet still provide the right kind of protection for Soldiers. "Probably the most important things are the lightweight armors -- the lightweight ceramic-composite armors," he said. "Traditional armors have been steels, aluminum, variations of steels that cause the round to break up and to tumble. The weight of those materials are causing burdens to the vehicle -- specifically in weight and size." Some of those technologies involve ceramics, and carbon-fiber products that provide the same protection as steel armor, but at a much lighter weight. That means that Soldiers stay safe, but that the vehicles the armor protects can carry more payload: more people, more supplies, or more weapons. "We have this awesome task of balancing performance, payload and protection," he said. "You want to ensure you get the best protection without eating up payload or performance." Recent developments in armor for vehicles, Knott said, have resulted in significant weight reductions for Army combat vehicles. "I think it's safe to say we are reducing today's armors compared to steel -- we can stop the same kind of round in about half the weight," he said. "Today, the state-of-the-art is ceramics, composites, and different metal matrix composites. And as we get farther out, I think there are opportunities to exploit electromagnetic and different types of defeat mechanisms." Westphal said he was impressed with the work he saw at TARDEC, and said that he sees progress being made toward Army goals of better energy efficiency and Soldier safety. "The work that's being done here is pretty essential to not only the current missions but pretty essential to how we modernize the Army and how best we move this equipping of the Army forward into the future," he said. The secretary also said he was unaware as to the scope and depth of research being done at the Army's Warren, Mich., research facility. "I didn't realize they were focused on so many aspects of the fleet and looking at everything from energy, to structure and mobility and so forth," he said. "I was very pleased to see the scope and breadth and comprehensive nature of their work." Finally, the secretary said he was pleased with the ability to talk directly with auto manufacturers to discuss Army needs and desires and to strike up relationships with them to move the Army forward with its goals. "Seeing that for the first time, after going through that period where the carmakers were going through tremendous economic crisis and all that turmoil in the industry and seeing where they have come from and what they are doing now and how they are looking at the future -- that was pretty exciting," he said. Still, Westphal said, building meaningful partnerships with the auto industry may prove challenging. He said the partnerships between industry, the Army and TARDEC will require more attention in the very near future if the Army is going to accomplish the things it wants to accomplish. "I think it will require greater openness by us, to engage with the private sector and academia," he said. "And I would say the same thing about them. They will need to be a little more flexible and open in dealing with the military and the government and the rules we work under."